Sunday night my dear friends JD and Catherine Sullivan invited me for dinner. JD is a good cook (see the sausage making video we did together; video also feature my partner in tools, Mac Dalton, an appearance by my young son, James, who now, lean and tall, looks me straight in the eye, and JD at the end; it’s a good primer on making sausage). But when I arrived to find that JD’s chicken Provençal was simply baked chicken with herbs I was prepared to be underwhelmed. JD explained that it was a recipe from the estimable Sam Sifton who runs the excellent NYTimes cooking site. Chicken is seasoned, floured, put in a baking dish and roasted for about an hour. It turned out to be a terrific preparation, thanks to the aggressive herbage, and also, importantly, lemon, whole garlic cloves and whole shallots, all of which flavor the rendering fat and juices that JD basted the chicken with throughout. You can use any Provençal herbs that you have on hand, but to my mind the most important is plenty of whole branches of thyme. 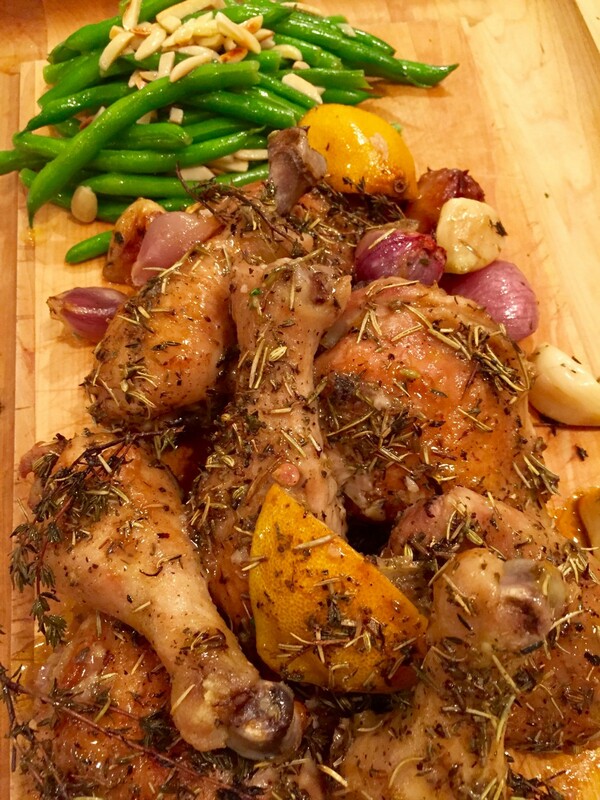 This is a terrific meal (eating the shallots and whole garlic gloves along the chicken) that couldn’t be simpler and allowed for plenty of time to talk and drink wine during the cooking process, perfect for a chilly Sunday evening or even a weeknight dinner. My past posts on New Cooking App: Feast, Happy New Year and Peace on Earth. Epicurious shares their top 15 chicken recipes. Blend your own herbs de Provence using Emeril’s base ratio. Learn more about the Provence region of France. © 2016 Michael Ruhlman. Photo © 2016 Donna Turner Ruhlman. All rights reserved. Ruhlman said the same thing about browning when I started cooking this. Not a bad idea but worked out just fin without. A Seattle icon recently passed away. How to run a successful business and treat employees fairly. Made this tonight using herbs from my garden (rosemary, sage, oregano, lemon thyme). Very easy to make and the results were quite tasty. However, the skin stayed a bit too soft. Next time I will give it a final blast under the broiler to crisp things up a bit. This goes on the list of need-to make-dinner-on-Wednesday-night-when-I got-home-later-than-planned-and-don’t-feel-like-doing-a-lot-of-prep meals. Could you substitute stock or white wine for the vermouth? I used Chardonnay and some homemade chicken stock and it was delicious! My chicken isn’t browning, put it in for another 10 minutes. Mike Snodgrass, Cook’s kitchen rated Gallo extra dry vermouth as top rated. I bought a 5th tonight for about $5.00. Easy enough to have around. Chicken never browned, but I had 1/4 more legs and thighs than the recipe called for and my large skillet was probably too crowded. It was delicious. Bread soaked in the drippings was excellent also. Michael I made this last night for friends and it was absolutely delicious!! Thank you for posting. I am not putting this in my arsenal! I meant to say NOW in my arsenal! Good grief! Sorry!